Just about everyone knows by now that tea offers a multitude of health benefits, but most don’t realize that there is one type of tea that may be better than all the rest. No, it’s not green tea or even black tea, it’s rooibos tea. Rooibos comes from an herb that’s native to South Africa. In fact, the only place in the world it thrives is in the region around Cape Town. While its many benefits have been valued in this country for centuries, it’s only just becoming popular in much of the rest of the world. But experts say it won’t be long before its sales even surpass that of its more well-known counterparts. Why? This red bush tea, as it’s also called, is loaded with powerful antioxidants, including quercetin, which is known to help protect against all sorts of illness and disease including cancer, diabetes and heart disease. In addition to this potent substance, it also contains a high concentration of two lesser known antioxidants, aspalathin and nothofagin. These polyphenol antioxidants help fight free radicals which can help slow the aging process, reverse visible signs of aging and protect against disease. 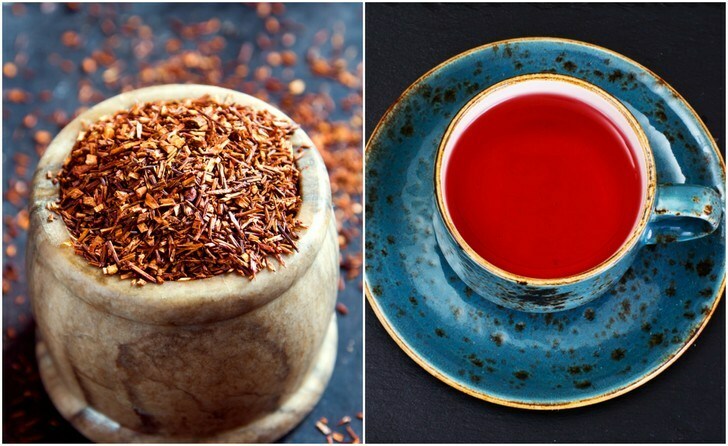 These compounds also offer nerve relaxing properties that may even reduce the risk of Alzheimer’s disease – it’s been said there is really no part of your body that won’t benefit from rooibos and its powerful properties. Here’s a closer look at why you should really start drinking this sweet-tasting, healing tea. Many people who consume the standard Western diet suffer from a variety of digestive illnesses that aren’t even heard of in other parts of the world that eat more healthy, whole foods. The digestive system is especially susceptible to a wide range of problems that are made worse due to a diet of processed foods. But thanks to this tea’s high level of flavonoids, particularly quercetin, it has the ability to encourage healthier digestion and supports the entire digestive system in a number of ways. Rooibos can help relieve diarrhea and cramps, ease nausea, stomach upset and indigestion, in addition to reducing inflammation and allergies. It’s also believed to alleviate colic in babies, and as it’s completely caffeine free, it’s also safe for them to consume. Of course, in addition to drinking rooibos, it’s also important to avoid processed foods and focus on a diet that consists of more whole foods that come directly from the Earth too. If you can do both, it’s incredibly effective for relieving chronic digestive issues like diarrhea, constipation and abdominal pain, due to its multiple compounds that provide antispasmodic properties that prevent these problems. Rooibos tea is also considered to be a safe and effective insomnia remedy. According to the South African Society of Sleep Medicine, as many as 40% of adults suffer from insomnia at some stage in their lives, and while there are many reasons behind that, such as stress, too much caffeine and underlying illnesses, the good news if you have trouble sleeping is that you can improve your quality of rest by drinking more of this tea. As the tea lacks caffeine but contains a high mineral content, including magnesium, calcium, manganese, zinc, and iron, it’s known to encourage calm and relaxation in addition to reducing sleep disturbances. Research published in the European Neurology Journal showed that during your deepest levels of sleep, calcium levels are also higher. According to William Sears, M.D. the brain uses calcium to manufacture the sleeping hormone, melatonin, which enhances the quality of your sleep. Other studies have shown that a magnesium deficiency can also lead to chronic insomnia. Magnesium, also called nature’s tranquilizer, has a calming effect on the nervous system which promotes better sleep. By sipping rooibos tea before bedtime, you’ll be supplying your body with much-needed calcium and magnesium for a more peaceful night’s rest. Rooibos contains a number of compounds that are known to burn belly fat, including polyphenols, antioxidants, and flavonoids, which is why it’s excellent for anyone who is trying to lose weight. If you’re tired of sipping black or green tea, consider switching it out for rooibos. According to findings published in Phytomedicine: International Journal of Phytotherapy and Phytopharmacology, researchers from South Africa looked into how the tea’s nutrients can fight obesity and discovered that drinking it causes leptin levels to rise. Leptin is a hormone that signals satiety, it’s how the body knows it’s had enough to eat. The experts found that it also prevented new fat cells from forming, and led to existing fat to be metabolized faster. This tea also contains alpha hydroxy acid which is commonly found in those expensive skin products for promoting healthier skin. It’s been shown to minimize acne when applied directly to the skin twice a day, although drinking it can help improve your complexion as well. It can also help to heal eczema, psoriasis, diaper rash, as well as the pain and itch of sunburns. Just apply a freshly brewed and cooled tea bag to affected areas to soothe and heal inflammation, and while you sit back, relax and let it go to work at healing, sip a cup at the same time for double the effects. In South Africa, many of the skin care products on store shelves feature rooibos as one of the ingredients. The powerful flavonoids in rooibos also help to regulate blood pressure and enhance the stability of capillary arteries. This results in a reduction of cholesterol buildup and blood clots, lessening the chances of heart attack and heart-related disease. It also contains a potent antioxidant known as chrysoeriol, which can improve circulation by preventing the activity of an enzyme known to trigger cardiovascular disease. A study from the Department of Anatomy and Histology at Daegu Haany University’s College of Korean Medicine in Korea demonstrated in 2012 that rooibos tea can aid in lowering high blood pressure by helping to regulate hormones secreted by the adrenal gland. This can be very important for those with diabetes, as one of its common complications is atherosclerosis, which causes inflammation and hardening of the arteries due to higher blood sugar levels. 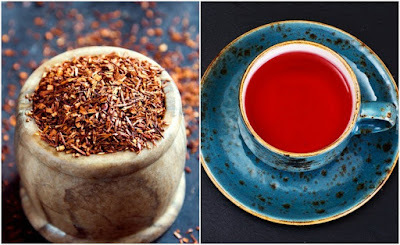 Two components found in rooibos tea, aspalathin and nothofagin, provide powerful effects on inflammation of the entire vascular system and are believed to be key in treating possible complications from diabetes related to the heart. Aspalathin is a very rare antioxidant – it’s found only in this tea, and no other beverage or food. Studies have found that in addition to protecting against vascular inflammation, it can protect the heart against oxidation, and a lack of blood to the heart, known as ischemia, which is a rather common complication of diabetes. Drinking rooibos tea may help to prevent some types of cancer,thanks to the plant pigment it contains, quercetin. In fact, many doctors are said to prescribe it in a supplement for to treat cancer, as it’s able to suppress malignant tumor growth by halting the processes involved in cell mutation. Some studies have proven a connection between consumption of rooibos tea and a reduction of cancer-causing chemicals, thanks to its high level of antioxidants, some of which have anti-mutagenic (anti-cancer) properties, including quercetin, which means that they can protect cells and DNA against damage, and help prevent them from developing into cancer. As mentioned, rooibos contains minerals like calcium and manganese, and those minerals help to support stronger bones. In fact, one of the most well-known benefits of all types of tea is improved bone strength as tea has been shown in studies to increase osteoblast activity. Osteoblasts are cells that create bone mass, which means the increased activity in these cells results in bones that are stronger, denser and healthier. Beyond the general benefits of all teas, rooibos tea is a stand out for bone health due its two specific flavonoids, orientin and luteolin. Experts say this is important as the tea contains no caffeine, so it can be given to patients who can’t normally consume traditional, caffeinated teas. Roobios tea helps to strengthen the immune system due to its high level of antioxidants, which can also help treat allergies. Its quercetin content is known to block mast cells, which are immune cells that are considered essential for triggering an allergic reaction. In fact, some experts believe it may have outstanding anti-allergenic potential, including being at least as effective as some prescription drugs, but without the side effects. A 2001 study from K. Kunishiro et al from the Department of Immunochemistry, Faculty of Pharmaceutical Sciences, Okayama University, Japan, published in Bioscience, Biotechnology and Biochemistry, found that rooibos tea extract modulated levels of interleukins, which are hormone-like substances that act as signaling molecules in the immune system, in a pattern that promoted the ability of the immune system to form a highly specific response. The researchers concluded that their results indicate a potential benefit of rooibos in allergy, infection and cancer treatment. Interestingly, the experts say these flavonoids are not only effective for treating seasonal allergy symptoms but food allergies, skin reactions, and asthma.